The last couple of weeks have been crazy hectic. Between packing up to move and taking inventory, we've also had a huge yard sale and are also planning another one for tomorrow. 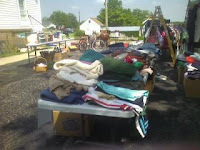 So far, we've sold around $2,000 worth of stuff. Since all the money's going towards the adoption, I hope we can sell a bunch more. I'll be glad when we get the yard sale done and once we get the Penske packed (and unloaded) next Wednesday. Needless to say, the blog posts may be a bit less sophisticated for the next week. We'll see.